The beauty of 18 roses, softly accentuated with lush lavender heather and waxflower. 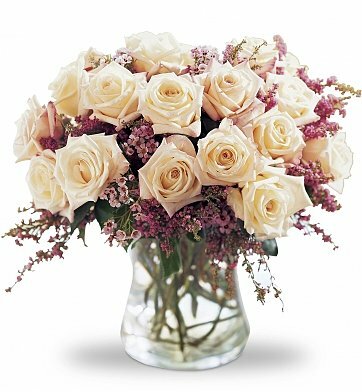 Your selection of pink, red, yellow or white roses, presented in a sparkling clear glass vase, filled with fresh water and ready to be displayed. 18 Premium Roses (50 cm). Arrives in a beautiful clear glass keepsake vase. Exact flowers and vase may vary depending upon location and availability. Monticello Rose Bouquet is a hand delivered gift. These gifts are delivered by one of our local design centers located throughout the United States and Canada. Same day delivery is available for most gifts when ordered before the cutoff time. The cutoff time for Monticello Rose Bouquet is 10 AM in the recipient's time zone. Beautiful flowers, I would give it 5 stars but the presentation I received is not like the one on the picture, they came in a tall bottle and the flowers looked more separated. I wanted this arrangement because it look compact, flowers look close to each other making it look "full". But I still got 18 flowers and my wife loved it.